South Korea is the ninth largest trading country in the world, 51.5million population, USD 1,538billion GDP, and 3.1% economy growth in 2017. In the facing of the fourth generation industrial revolution, and the strengthen environmental regulations since 2020 is steadily demanding for eco-friendly, high performance and high value added specialty products, as results investment in environmentally friendly and smart products are continuously increasing, and new future products are expected to show faster market growth than existing ones by improving the production environmental. The products will become more advanced to premium, core components to depend on import will be more localized, and also improvements of R&D and marketing capabilities are expected. The material industries of petrochemical, steel and textile are expanding the proportion of new material thru upgrading the production items, automotive, home appliance and telecommunication sectors are increasing the production of premium products, display and semiconductor are expected to make continuous efforts to sustain a gap in the high technology from competitors and also a huge investment to do so. 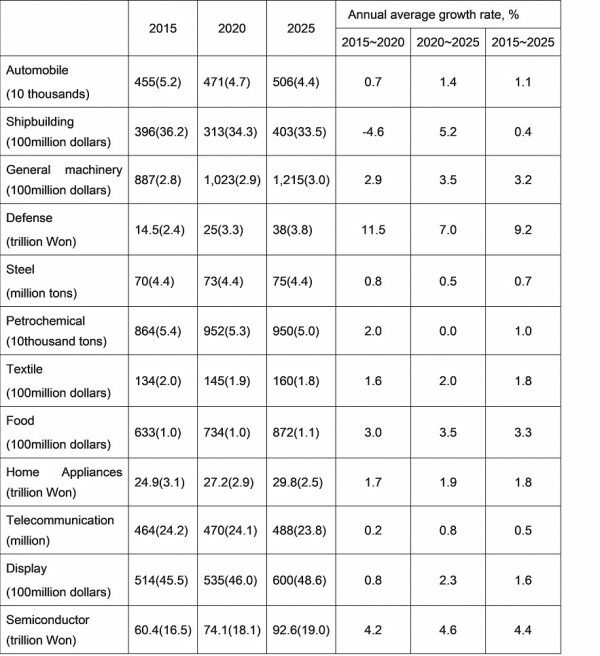 Source: KIET (2016) Future vision and development strategy for Korean flagship industries, ( ) is the world market share. Over the past three decades the South Korea automotive industry has dramatically expanded, in 2017 the sixth largest manufacturer in the world, and has become a key motor for the domestic economic growth, contributing more than 10% to the national GDP, 80% in localization, 50% production in abroad. The future features show the eco-friendly automobile growth, transformation to smart product, and more advanced export car, and the government led supporting for eco-car (HEV, EV, and FCEV) and autonomous vehicle. The exports are expected to grow at a higher rate than production. It’s the core industry to supply the manufacturing facilities such as construction, machine tools, semiconductor and LED equipment, the fifth largest manufacturing industry, the second biggest business companies and the third biggest employer, some high-end products but most of them are focused on mid-tech oriented products, transforming to a smart product and expecting the growth of environmentally friendly lightweight materials. If the global economy recovers the demand for machinery is expected on the rise due to the increasing construction and facility investment. Asia is a continent where the defense expenditure is on the rise, with four of top 10 countries (China, India, Japan, and South Korea). South Korea has the world’s sixth largest military forces and grown far faster than the regional average, and continues to be a major defense and security ally of the US in the Pacific Region. In addition to the external scale growth, the government support for qualitative development and modernization is expanding in the sectors of core component localization, R&D capability security of domestic companies for the original technology, transformation into smart products. Driven by a steady increase in military spending and diversification of export to Europe, Middle East and Africa it’s expected to witness a strong growth in the medium and long term future. The domestic food market has the growth potentiality to increase production due to its small size and low export share in comparison to other countries which has similar population and economic size, and has been characterized by an expansion of products to emphasize the exclusion of chemical additive, increased public interest in HMR, and weaning foods and products for infants as well as the foods for adults. Also, K-food globalization is prospective to expand into Asian markets such as China and new entrance into Islamic food market by utilizing strengths of geographical proximity, similarity of food culture in Asia countries. The global market share has been expanding with the exclusive monopolistic power in the memory sector, the high quality products is produced in domestic and the general ones are manufactured in abroad, the world’s best R&D capability, and system semiconductors to correspond with smart products grow fast. New technologies such as AI and IoT that are part of the fourth industrial revolution requires advanced semiconductor performance, which brings with it new opportunities, and will become an engine for new growth. Samsung group announced $22 billion investment over the next three years in growth area such as AI and 5G technology. Fenetre Partners is a leading consulting firm of market entry support for the Japanese and Korean Markets. Our clients range from SMEs to big multi-national companies mainly from the US and Europe. We provide our clients with the following market entry support services. public and private sectors in South Korea. also arrange all logistics and translation. and pre- & post-sales technical support on behalf of you. best one. We also support the implementation of those activities. In charge of Korea, resides in Seoul. He is the representative of Fenetre Partners Korea, with over 27 years experiences in global industrial market he has been specialized in the market and business development. His previous careers to establish new businesses basement across Asia Pacific regions and his specific engineering background make customer demands approached differently and lead the customers to satisfy with their unmet needs. He is a quite result-oriented business professional with proven abilities in strategic planning and continuous revenue growth, and his most empowered area is the customized management leadership to fit in the multi-cultural clients and help small business maximize the bottom-line results. He earned his B.A. in Mechanic Engineering from Seoul National University of Science & Technology and e-MBA certification.